A peer who opposed a museum's decision to sell a 4,000-year-old statue will get £6m after striking a private deal with a council, it has emerged. 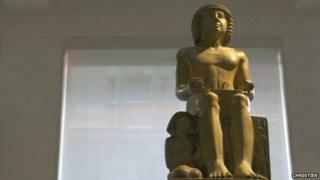 The Sekhemka statue sold for £15.76m at Christie's of London auction was given to Northampton Museum by ancestors of the current Lord Northampton in 1850. Northampton Borough Council said he would get 45% of the sale price. The peer originally said the Conservative-led council had no right to sell the statue. The sale was earlier labelled a "shameful and unethical act" by the Egyptian Embassy. Christie's said the buyer had demanded anonymity and the auctioneer would not clarify whether the buyer was an individual or an institution or whether the statue would be leaving the UK, citing "buyer confidentiality". A spokeswoman for Christie's said she was not aware of any contact between the auctioneer and the Department of Culture Media and Sport (DCMS) which has powers to impose export bans. DCMS said it considered such bans in cases of items which have been in the UK for more than 50 years. In this case it might only find out where the statue is going if an export application for it is made. Lord Northampton's ancestor the 2nd Marquis of Northampton brought the statue back from Egypt after a trip in the 19th Century. The 30in (76cm) limestone figure of a court official clutching beer, bread and cake - items for the afterlife - is believed to have been acquired by Spencer Compton, the second marquis, in 1850 and was later presented to the museum by his son. The council held "commercial negotiations" with Lord Northampton lasting more than a year, over the sale of the statue. His initial objections - raised when the council first announced it planned to sell the statue in 2012 - were resolved at a cost to the council of £10,000 in legal costs. Northampton Borough Council has not made details of its the legal arrangement with the peer public. Brendan Glynane, an opposition Liberal Democrat councillor, described the agreement as "tawdry" and accused the council of a lack of transparency over the statue's sale. "It is terrible. I think the sale was completely wrong and the full ramifications of this are yet to unfold," he said. Mr Glynane said the reputation of Northampton and its council had been damaged. The council and Lord Northampton are yet to respond to the comments. When the council consulted the public on the proposed sale of the statue, 51% of those replying were in favour and 49% were against. But the council, which will keep £8m from the proceeds of the sale, defended its decision to sell. David Mackintosh, council leader, said the money would be used to redevelop the existing museum building. However, the museum's accreditation with Arts Council England is now under threat, the council confirmed. A panel will meet later this month to decide whether or not to remove its accreditation. Scott Furlong, of Arts Council England, said: "It is very disappointing that the local authority committed to the sale and entered into an agreement with an auction house before our discussions with them were concluded."